Dr. Ferreira is the director of the Laboratory of Basic and Clinical Muscle Biology in the Center for Exercise Science at the University of Florida. Dr. Ferreira’s clinical experience with patients suffering from muscle weakness and fatigue triggered his interest in muscle biology and his research is focused on understanding how chronic disease, especially heart failure, causes abnormalities of the diaphragm (breathing muscle). Loss of diaphragm function causes breathing abnormalities and contributes to the morbidity and mortality of heart failure. Dr. Ferreira uses a translational approach with studies in pre-clinical models and patients to identify therapeutic targets to counteract the loss of diaphragm function with rehabilitation and pharmacological interventions. 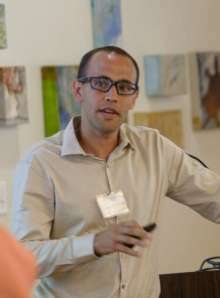 In the laboratory, Ferreira and his students use an integrative approach with state-of-the art techniques to study force production by intact muscles (in vivo and in vitro) and single muscle fibers, measure protein and mRNa abundance, and examine molecular events in whole-tissue and cultured cells (e.g., fluorescence imaging).